By Andrew KnittleState-recognized tribes are starting to get more and more of the funding “pie” available to their federally recognized counterparts, the president of the Delaware Nation of Anadarko said during a recent business luncheon in Oklahoma City. The problem with that, Holton said, boils down to dollars and cents. 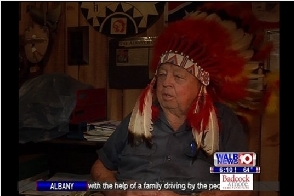 “They're taking some of our pie,” he said of the billions in government aid provided to the nation's tribes each year. “That's our money.”Comment: Here we see the problem of unrecognized "tribes" such as the Tchefuncta Nation. Many aren't just interested in promoting their Native heritage. They want government benefits and the right to open a casino. That's why it's important to distinguish between Ward Churchill, Elizabeth Warren, Johnny Depp, "Queen Chief Warhorse," et al. and real Indians. The issue isn't just their individual situations. It's how labeling them Indians shifts the goal posts for everyone. If we define everyone with a "drop of Indian blood" as Native, the pool of Indians grows to a quarter or a half of the US population. It includes almost every Latino, for starters. Do we really want to give them benefits even though they aren't members of a tribe with a continuous history, culture, and government? Perhaps more important, do we want them defining what it means to be Native? As we've seen in Depp's case, he thinks the essence of indigeneity is a white man's painting of a fictional "warrior" with a bird on his head. Like old Western movies, Depp's fairy-tale character will define Indians for a generation of movie-goers. "Queen Chief Warhorse" wears a Plains headdress and Depp has one tattooed on his arm. These people are operating based on stereotypical notions of Indians. They've got no business claiming recognition or taking resources from real tribes. Weeding out the wannabes helps ensure that the aid and attention go to the right people. For more on wannabe tribes, see "Chief Ron" to Be Evicted, Pembina Wannabe Charged with Fraud, and "Absent Shawnee of Ohio" Wannabes. For more on wannabes in general, see Wannabes Obscure Real Indians, Tribalism Is Trendy, and Why Wannabes Wanna be. Below: "Chief Rattle Snake" of the American Cherokee Confederacy.